I loved Miranda July from the first moment I laid eyes on her. Her first movie was strange and wonderful. Her short story collection was obtuse and compelling. Her project website was an artistic challenge to viewers like nothing I had seen before. In short: I will be loyal to this woman no matter what she makes– good, bad, and everything in between. 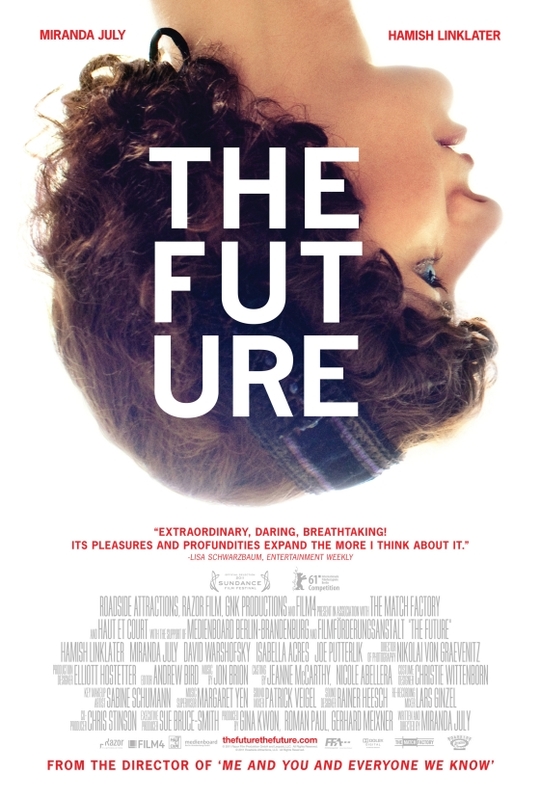 I did not love “The Future” in the same way that I loved “Me and You and Everyone We Know.” But it took my breath away more than once. It made me cry more than once. And it should come as no surprise that I would recommend the film to anybody who likes Miranda July even just a little bit. Judging by some of the harsh customer reviews on the Redbox rental site, I appear to be in the minority when it comes to liking Miranda July. So be it. This movie is sprawling, surreal, and difficult. It is narrated by a cat. The two protagonists– especially Miranda July herself– are hard to love. None of those things are negatives because the film has a pulsing, beating heart and ugly, glorious guts to match. Interesting work, your thoughts seem to echo what I have been generally hearing about this film. I do hope to see it soon, though. Thank you for the kind words, Matt.